Hearts head coach Robbie Neilson has warned Celtic his team have improved since claiming a point on their previous trip to Parkhead. Neilson’s side lost 3-0 to St Johnstone in their most recent game but that followed a run of four consecutive wins and clean sheets. And Hearts travel to Glasgow on Saturday confident they can go one better than the goalless draw they secured at Celtic Park in September. 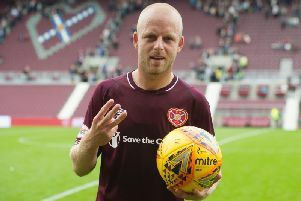 “We defended well and had an opportunity to nick it at the end,” said Neilson, whose side also held Ladbrokes Premiership leaders Celtic at Tynecastle. “We have progressed recently. The players that have come in have more experience of the Scottish game, the younger players have more experience of playing first-team football, so I think we are in a better position than we were the last time. Neilson confirmed on Hearts TV that defenders Alim Ozturk and Igor Rossi were in the squad after recovering from injury.